As the Luftwaffe (German air force) lost control over the skies over Europe in the second half of the Second World War, it could no longer provide sufficient protection for the German ground forces against Allied and Soviet aircraft. Panzer divisions were especially affected by the lack of the air fighter cover as they were always at the center of the most intense fighting. While the Germans already had copious amounts of half-tracked SPAAGs of different calibers and weights (Sd.Kfz.10/4, Sd.Kfz.6/2, Sd.Kfz.7/1, etc), these had the significant flaw of being themselves vulnerable to the planes they were meant to hunt. A tank based anti-aircraft vehicle could solve this problem, as it would have the armor to resist most aircraft armament, but little effort was done in this direction. The first unsuccessful attempt was the Flakpanzer I built in limited numbers (some 24 vehicles) at the beginning of the war. It was constructed by removing parts of the hull and the tank turret. Then a new modified crew compartment with a 2 cm Flak 38 was installed. It had a limited combat value due the low number built, low armor protection and cramped crew compartment. A few years later, a second attempt was made by mounting the same 2 cm Flak 38 on a modified Panzer 38(t) chassis. This vehicle was built in some numbers but was generally considered to be unsuccessful, mostly due to the weak fire power of the 2cm Flak 38 by this late stage of the war. The TNH – LT vz.38 tank was developed and built by the Czech ČKD company (Českomoravska Kolben Danek) in the second half of the 1930’s. Production of the vz. 38 began in late 1938 but, by the time of the German annexation of Czech territory, not a single tank was handed over to the Czech army. Germany captured many brand new vz.38 tanks and, in May 1939, a delegation was sent to the ČKD factory to examine their operational potential. The Germans were so impressed with this tank that they were quickly introduced into Wehrmacht service under the name Pz.Kpfw.38(t) (the ‘t’ stands for Tschechoslowakei/Czechoslovakia in German) or simply Panzer 38(t). The ČKD factory was completely taken over for the needs of the German army under the new name BMM (Bohmisch-Mahrische Maschinenfabrik). The Panzer 38(t) was built in relatively large numbers (141 vehicles), seeing combat action from Poland to the end of the war, and was considered an effective tank for its class. But, from late 1941 onwards, it was obvious that it was becoming obsolete in the role of first-line combat tank. 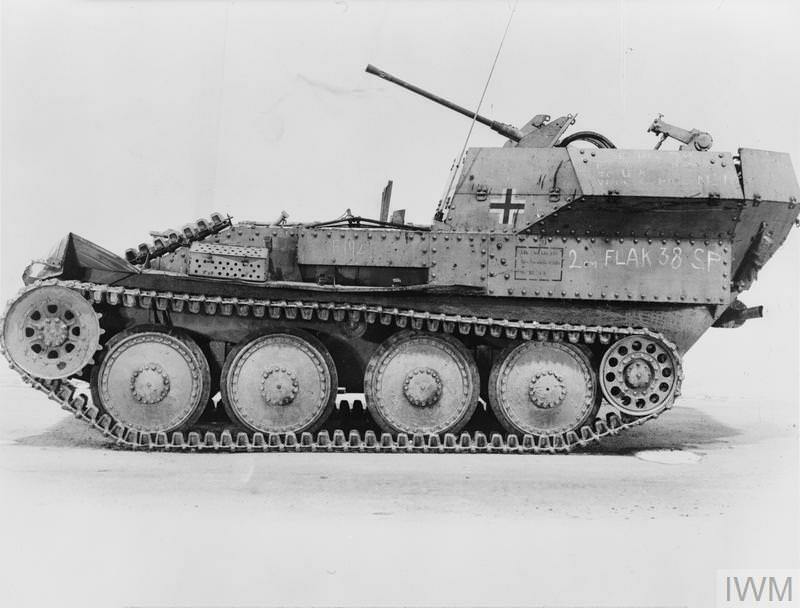 The Panzer 38(t) chassis, on the other hand, was mechanically reliable and was highly suitable for other purposes, a fact which the German exploited to the maximum. 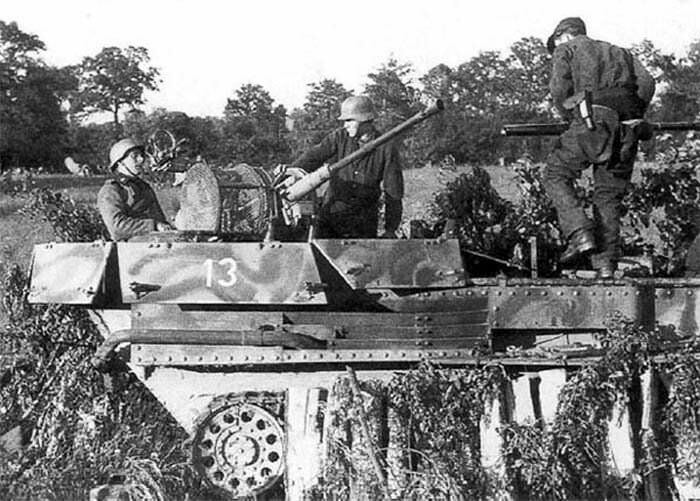 Many different armored vehicles were built using the Panzer 38(t) chassis, including a Flakpanzer version. 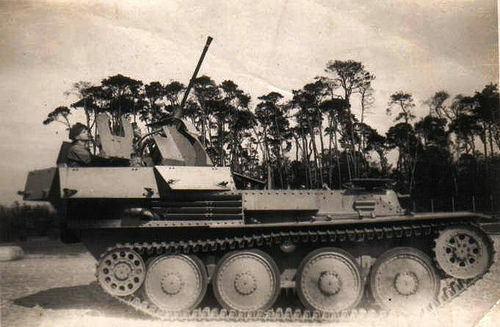 The first purpose-designed Flakpanzer prototype was built using one modified Panzer IV tank chassis (2 cm Flakvierling auf Fahrgestell Panzerkampfwagen IV). This prototype was sent to Kummersdorf (in September 1943) and presented to a military inspection which was led by General Heinz Guderian. The larger and more powerful 3.7 cm Flak 43 anti-air gun was preferred, so none were built and, instead, the prototype was sent back to the Krupp factory in order to be redesigned and modified to accept the larger caliber weapon. As the Flakpanzer based on the Panzer IV tank chassis was not be finished in a reasonable time (the refusal of the Flakpanzer IV armed with the 2 cm Flakvierling added to delay of the Flakpanzer IV project) and because of the high demand for such a vehicle, Hitler issued an order (October 1943) for the Panzer 38(t) chassis to be used as a temporary solution. The engineers of the BMM began the work on the first prototype, which was built relatively quickly. This was accomplished by using already existing production capacities and designs. They simply reused and redesigned the already existing 150mm Grille Ausf.M chassis (also used for the Marder III Ausf.M), which enabled the rapid completion of the project. After inspection of this prototype by the German military officials, an order was given for a production of 151 (or 161 depending on the sources) such vehicles as quickly as possible. This small manufacture order, at odds with the high demands for such a vehicle, can be explained by the fact that the production of the more powerful Flakpanzer IV was expected to start in early 1944. The official name for this vehicle was Flakpanzer 38(t) auf Selbstfahrlafette 38(t) Ausf M (Sd.Kfz.140), but most often, only the shortened name Flakpanzer 38(t) is used. Sometimes (in some sources), the nickname ‘Gepard’ is wrongly attributed to this vehicle. The nickname Gepard was used for a German anti-aircraft vehicle built after the war. It was never used by the Germans for the Flakpanzer 38(t). As already mentioned, the Flakpanzer 38(t) was based on an already existing chassis with some necessary modifications, mostly to the crew compartment. 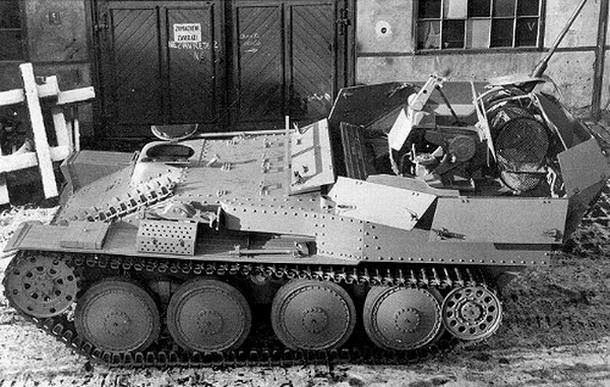 The Panzer 38(t) Ausf.M chassis was a variant with the engine compartment being moved to the centre of the vehicles (the M stands for the German word ‘Mitte’, which means in the middle or centre) and the fighting compartment moved to the rear. The superstructure was redesigned by adding a sloping front plate that had a large hatch door which made it easier to access the brake and transmission assemblies (in case of emergency and repair). Usually, spare tack links were added to the left side of the front plate, to act as extra armor and as a replacement for damaged tracks. The previous front crew compartment where the driver and the radio operator were located was completely changed. The radio operator position was moved to the new (open) rear crew compartment. The driver remained alone in a specially built compartment on the front right side of the vehicle bow. The driver got into the vehicle through a top split hatch and had two observation ports in front and on the right side. Behind the driver was the new engine compartment, with the Praga AC 6 cylinder (150 hp) engine (with five forward and one reverse gears). With this engine, the Flakpanzer 38(t) could achieve a top speed of around 42 km/h and some 20 km/h on cross country. The operational range was 185-200 km and 140 km of cross country. The suspension and the running gear were mostly unchanged and consisted of four large road wheels (connected in pairs to a central horizontal spring), a front drive sprocket and a rear idler. The only visible difference was the reduction of the number of return rollers from four in total to only two (with one on each side). The rear fighting compartment which housed the main weapon was enclosed with eight shield plates. It had an open top which allowed the crewmembers to have a better view of the environment and search the sky for enemy aircraft. The upper part of each of these eight armored shields could be folded down. This was necessary in case the crew had to engage ground targets or low-level attack aircraft. When these shield plates were folded down, the only protection for the crew was the gun shield itself. In some vehicles, the rear of the gunner seat had an armored plate installed. According to some photograph of brand new manufactured vehicles, this modification seems to be a factory made and not a field modification. This vehicle was lightly armored, with a maximum thickness of only 15 mm. The rear open-topped upper superstructure (10 mm of armor steel plates) provided only a limited protection for the gun crew. The Flakpanzer 38(t) was built by a combination of riveted and welded plates. The main gun was the 2cm Flak 38 with some 1000 rounds of ammunition (usually half was HE and the other half was AP). Ammunition for the 2 cm gun was placed below the main weapon mount in several ammo storage boxes. Some ammo boxes were placed on the inside armored walls along with other equipment (crew belongings, gas mask containers, etc). In front of the gun there was one long box that contained a few spare gun barrels. The elevation of the 2 cm Flak 38 was -5° (-10° according to some sources) to +90° with a traverse of 360°. Only when the armored walls were dropped down could the 2 cm Flak 38 be traversed at 360°. The maximum rate of fire was 420-480 rpm, but 180-220 rpm was a more practical rate of fire. Beside the crew’s personal weapons (mostly pistols and MP 40), no secondary weapon was provided for self-defense. This vehicle had four (or five depending on the source, but due the limited space inside the vehicle four is the more realistic number) crew members: the gunner, one (or two) loaders, a radio operator and the driver. Beside the driver (who was positioned at the front right side of the vehicle bow), the remaining crewmen were located in the rear position where the main gun was. Only the driver was fully protected inside the vehicle. The loader was located to the left side of the gun, ready to load the 20 round clips into the main weapon. The radio (Fu 5 or Fu 2) and its operator were located in front of the loader at the left front side of the crew armored compartment. The gunner position was at the weapon’s rear, in the gunner seat. 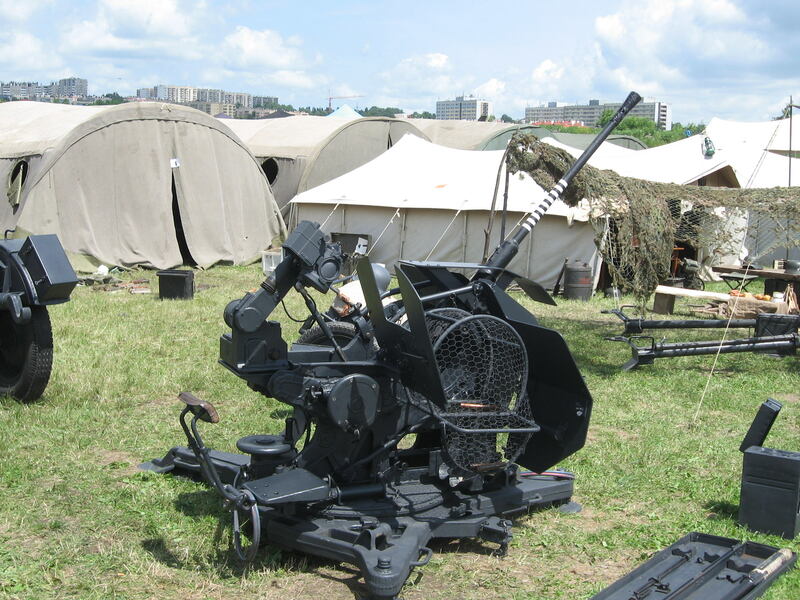 The gun was operated manually, with two hand wheels. The gun was elevated by the right hand wheel and traversed by one wheel located in front of the gunner (a relatively simple system). This crew workspace was quite cramped with only a limited amount of space. The role of the vehicle commander belonged, depending on the source, either to the radio operator or the gunner. Being an open-topped vehicle and with low thickness armor, crew protection was on a very low level. Camouflage and a well selected field position were essential for survival. As an open topped vehicle, the crew was also exposed to weather conditions. A canvas cover could be placed over the vehicle but it limited the crew’s view of the surroundings. Total weight was some 9.8 t. The length was 4.6 m, width 2.15 m and the height was 2.25 m.
Flakpanzer 38(t) auf Selbstfahrlafette 38(t) Ausf.M (Sd.Kfz.140). Illustration by David Bocquelet, modified by Jaycee ‘Amazing Ace’ Davis. By April 1944, several anti-aircraft tank platoons (Panzer Flak-Zügen) were formed, each equipped with 12 Flakpanzer 38(t) vehicles. These anti-aircraft platoons were used to equip several Army (Wehrmacht) and SS Panzer Divisions (like the 9th SS Panzer division, 10th SS Panzer division, 2nd Panzer division, SS Panzer Division Hitlerjugend, etc). The last anti-aircraft platoon to be formed in June 1944 was given to the 17th SS Panzergrenadier Division. From the 141 vehicles built, most went to the Western front (84) and a smaller number were sent to Italy (some 48). The rest were probably used as training vehicles. Due to the Allied invasion and later liberation of France, most were lost on the Western front by the end of August 1944. Only a few survived and by December 1st 1944, only the 17th SS Panzer Division (six) and the 2nd Panzer Divisions (three) still had them. The ones used in Italy had more luck, and around 21 were still operational by the end of the war. According to some sources, the Flakpanzer 38(t) was used even on the Eastern front in limited numbers. As the Flakpanzer 38(t) was built only in small numbers, any vehicles lost in combat could not be replaced. During the Flakpanzer 38(t)’s short service life, several faults of the design were noticed: weak armor, insufficient fire power (in spite of that, it managed to shoot down a number of Allied planes) and maybe the biggest fault was the need to fold down the side armor walls in order to use the main gun effectively against ground and low-level targets. While the crew lowered the sides, valuable time was wasted if it was needed to engage enemy planes urgently. On the other hand, the Flakpanzer 38(t) did help to solve the problem with the mobility of anti-aircraft guns, as it could follow the Panzer Divisions on any terrain. The 2 cm gun was also useful against soft ground targets and infantry and was often used in this role, but due to low armor thickness this deployment was dangerous to the crew. 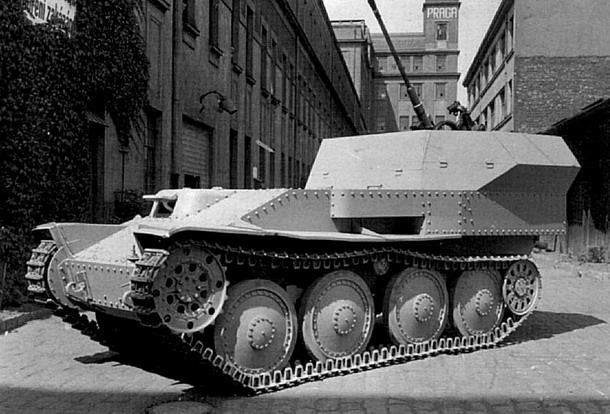 The Panzer 38(t) chassis was mechanically reliable and was deemed adequate for this modification. As this vehicle was considered a stopgap and not many were produced, it did not have any major impact on the war. Although the demand for such anti-aircraft vehicles was high, only a small number were ever made. This is mostly due to the 2 cm Flak 38’s poor operational combat performance by the time of the second half of the war and the beginning of the production of the much better Flakpanzer IV vehicles. In total, some 141 Flakpanzer 38(t) were built by BMM from November 1943 to February 1944 when production ended. Production by month was: 50 vehicles in November 1943, 37 vehicles in December 1943, 41 in January 1944 and the last batch of 13 in February 1944. According to some sources, around 151 were built. The 10 incomplete chassis that were to be built as the Flak version were instead reused for the self-propelled Grille vehicle. The Flak 38 was designed by Mauser-Werke (in 1938) in order to replace the older Flak 30 that was already in use by the German army. Although the performance of the Flak 30 largely met the needs of the German army, the greater rate of fire was more desirable. The Mauser-Werke engineers made only a few minor changes to the original Flak 30 (bolt mechanism was changed, accelerator and the return springs were replaced with new redesigned ones, the mounting was the same, etc). It was designed to shoot down low-flying aircraft, but it was also found to be very effective when used against unarmored ground targets. The 2cm Flak 38 proved to be a successful weapon during war but, by the second half of the war, it had become obsolete. It was planned to be replaced with larger caliber weapons. As these were never built in larger numbers, the 2 cm Flak 38 remained in use to the end of the war with over 17,000 guns being produced. Beside the original single barrel version, the 2 cm Flak 38 was built in several different versions: 2 cm Geb Flak 38, Flakvierling 38 and the Flakzwiling 38. The 2cm Flak 38 was also used as a mobile mounted weapon on several German vehicles, like half-tracks (Sd.Kfz 10/4), tanks, trucks, and even armored trains. The 2cm Flak 38 had 6 crew members. Its effective range was 2 km (6562 ft.) or 2.2 km (7229 ft.), depending on the source, with the maximum horizontal range of 5782 m (5230 yds). The maximum rate of fire was 420-480 rpm, (180-220 rpm was a more appropriate operational rate of fire). The gun could traverse a full 360° and the elevation was –20° to +90°. The weight in action was some 406-460 kg. 2cm Sprgr Patr L/Spur (Ub) – Empty practice shell. Naoružanje drugog svetsko rata-Nemačka, Duško Nešić, Beograd 2008. Waffentechnik im Zeiten Weltrieg, Alexander Ludeke, Parragon books. Kraftfahrzeuge und Panze, der Reichsehr, Werhmacht und Bundeswehr ab 1900, Werner Oswald 2004. PANZER TRACTS No.12 Flak Selbstfahrlafetten. Thomas L. Jentz. Fighting men of WW II, Axis Forces, David Miller, Chartwell Books 2011. Armor at war series, German self-propelled guns, Gordon Rotman. Gepard, The history of German Anti-aircraft tanks, Valter J. Spielberger, Bernard & Graefe Verlag Munchen 1982. Flakpanzer 38(t) auf Selbstfahrlafette 38(t) Ausf M (Sd Kfz 140), AFV Interiors Web Magazine. It is sometimes, incorrectly, referred to as the Gepard, which may lead to confusion with the unrelated Flakpanzer Gepard.